changed their name and tried again, does anybody know? The Objectives came from Greensboro, NC and the Cheeco production credit confirms this location. This 45 came out around the same time as the Little Charles (Whitworth) release which you can read about and hear on this page - it's possible that the multi talented Whitworth may be singing on this track. 1. 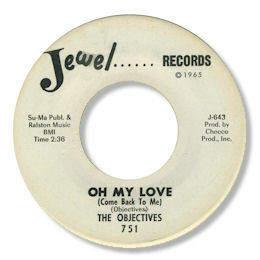 "Oh my love" can be found on the Westside UK CD "Soul Jewels Vol 1". 2. This disc was leased to Jewel at the same time as Little Charles Whitworth’s. Could he have been involved in his one as well?